The Pavilion of Prolonging Splendor (Yanhui ge) is located in the northwest part of the Imperial Garden (Yu huayuan), against the north wall. First constructed in the Ming dynasty (1368-1644), it assumed the current name in the Qing dynasty (1644-1911). In Qing dynasty, the Pavilion of Prolonging Splendor housed the selection ceremony of imperial concubines among girls from the "Eight Banners”. It appears to be a two-storey building for its outward looking, yet in fact a blind storey was constructed in between. Surrounded by twisting verandas, the pavilion forms left-right structural equilibrium in correspondence with the Mountain of Accumulated Elegance (Duixiu shan) in terms of architectural arrangement. 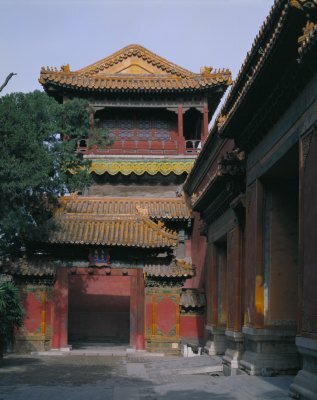 Mounting the pavilion, one can enjoy sceneries of both the Imperial Garden and the Prospect Hill. It is said that Snows covering the Xishan Mountain can also be seen from here when the sky is clear in winter. Many Qing dynasty emperors, including the Qianlong Emperor (r. 1736-1795), the Daoguang Emperor (r. 1821-1850) and the Xianfeng Empror (r. 1851-1861), composed poems to chant this pavilion.